If you or your student needs to improve your self-confidence, then homeschooling debate is just for you. Use your homeschool high school to give you the self-confidence you need to effectively present any argument. Chances are your family has already experienced debating. Siblings will naturally do it among themselves from time to time! Right, Mom? Well, this is a different kind of debate. Here we’re talking about (and I quote Merriam-Webster) a regulated discussion of a proposition between two matched sides. Basically, two teenage students form a team and debate an opposing team after having researched an assigned topic. Another mom and I taught about half a dozen interested students our first year. With the help of two informative books below, we got them off to a great start. I highly recommend them. 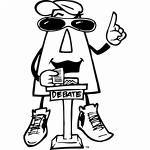 Beyond being exciting and fun, debate develops very practical skills that can be used throughout a lifetime. Debate requires an ability to intellectually understand complex issues, research and gather information on an issue, analytically construct arguments, think clearly and quickly, swiftly and thoroughly rebut arguments, ask penetrating questions, speak clearly at a moment’s notice, and present arguments clearly and concisely to an audience of peers and elders. No matter what you plan to do in life, you will face situations in which you must be able to give an answer for what you believe, often in the face of another’s arguments. Simply learning to think analytically and evaluate arguments will tremendously benefit anything you do in life. Increases knowledge about current events. Increases ability to articulate intelligently with peers and elders. Life-long skills acquired: research, writing, editing, computer, critical thinking, and speaking skills. Confidence, coupled with character, helps build the active citizenry currently lacking in our country. That really is it in a nutshell. Laura and another student did so well that year, that they agreed to teach the next class together. They did a great job, using the books mentioned above. The children never debated in a state meet, but they had ample opportunity in class to debate each other. And they loved it! In college, Laura used her public speaking and debate skills to the test in Model UN. Because she had learned how to research a topic and think on her feet she did very well. They were expected to critically evaluate other delegate's arguments to find areas where they could be further developed. Her words, not mine. :) And the neat part was she met the Ambassadors to the United Nations from Oman and Tonga while in New York! If you have a child wanting to learn to speak (or you have a shy child needing to learn! ), I would strongly encourage you to start a homeschooling debate class in your area. Yes, it will take some time out of your already busy day, but the benefits far outweigh the effort everyone puts into it.